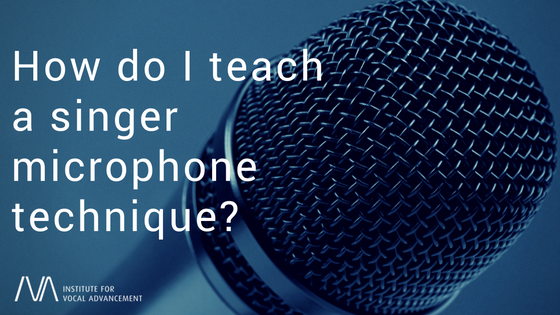 You are here:Home Articles How do I teach a singer microphone technique? Microphones each have a field or range which picks up the voice. Some microphones are designed to pick up sound from any direction (known as omni-directional), while others are designed to pick up sound from a limited area. So it would be a good idea to find out what type of mic the singer is using to help them know how to use it. In the worst case scenario, they will have to work with the mic during a sound check or rehearsal; but it would be better to spend time with the actual mic well before doing a gig. Ideally, you have a small P.A. in your teaching studio for your students practice in. However, if you don’t, your student can still experiment with amplified sound by using their home stereo or a karaoke machine and a microphone. The quality may be poor (depending on the system), but they should still be able to get a basic idea of mic positioning and distance with a little practice. Take a look at our “What equipment do you need to be a singing teacher” blog post for some recommendations. Set the volume controls so that the backing track is lower than your student’s voice. The most common mistake is holding the microphone too close or too far from the mouth. This can result in your singing sounding muffled and distorted or too distant or no vocal sound at all. To avoid distortion, the mic should be held no closer than 2 to 3 inches from their mouth during normal singing. When singers are told to “eat the microphone,” this does not mean they should literally eat it. The microphone should be kept about one or two inches from your mouth. In the world of microphones, this really is “eating it” and is how you will sing live, generally speaking. Gradually have them move the microphone forward and back as they continue to sing and listen to the effect. At what point does the vocal sound start to fade or thin out in tone? That is the furthest point to remember. The optimum distance for clarity is between the shortest and furthest points. This is your default resting position. You then need to move the mic further or closer depending on what you’re doing. There are times when they will be using more volume, hitting higher or louder notes on the chorus of a song, for instance, vs using lower or softer notes in the verses. When they get louder, the idea is to move the microphone slightly away from the mouth. The variance in distance will be proportionate with the increase in volume – that is, the louder you sing, the more you pull back – but how far is something you’ll need to determine by getting to know the mic. It will probably never be more than 5 or 6 inches. You will have to experiment a little, as the distance is dependent on the singer’s natural power and ability to project. Keep in mind that some singers compensate for poor vocal technique with mic technique. They can’t help but sing “shouty” high notes so that have to pull back on their mic. Conversely, some singers have breathier voices so they need the mic to be close up and “cranked” at all times. While good mic technique can help a limited singer make it through a gig, these students should still be encouraged to continue developing vocally so their dynamics are a choice and not a necessity. We want the changes in volume to be heard as naturally as possible; creating and reducing the distance to avoid clipping the microphone with too much volume and air, and to prevent lower frequencies from disappearing when you get quiet by introducing the proximity effect. It’s tricky to pull off well. The best thing we can do is practice a dynamically challenging song with the microphone we plan to use most frequently. If a singer can do their own “mixing, in other words, pulling back a little or leaning in a little, it evens out the sound that people are hearing! P.S. Never let the singer point the mic at the speaker where the sound is coming out…unless you want Armageddon, in the form of feedback, to rain down on the audience! Also to keep in mind , the sound of the music should be equal or less than the voice of the singer . How do you prevent this without the aid of a sound engineer or years of experience? Simple! – Practice makes perfect and if you have the facilities to set up a P.A. and tape recorder at home or use a rehearsal studio you have a distinct advantage!! Even if you don’t have this equipment, you can still experiment with amplified sound by using your home stereo or karaoke machine and a microphone. The quality may be extremely poor and muffled (depending on how good the system), but you should still be able to get a basic idea of mic positioning and distance with a little practice. Thanks for share Your Post……!